When I was younger, playing miniature sous chef to mum in the kitchen had its perks. The promise of the leftover batter at the end of a baking session was enough reason to don an apron, and the classic rice crispy recipe and its gooey marshmallow, toffee, butter and rice bubble concoction, had to be the quintessential kid-friendly recipe. I set myself a mission to create a healthier option that tasted just as good - so here's my take on it, and better yet it's chocolate flavoured! Wherever possible, I've switched up the ingredients in the original recipe for alternatives that offer added nutrition. 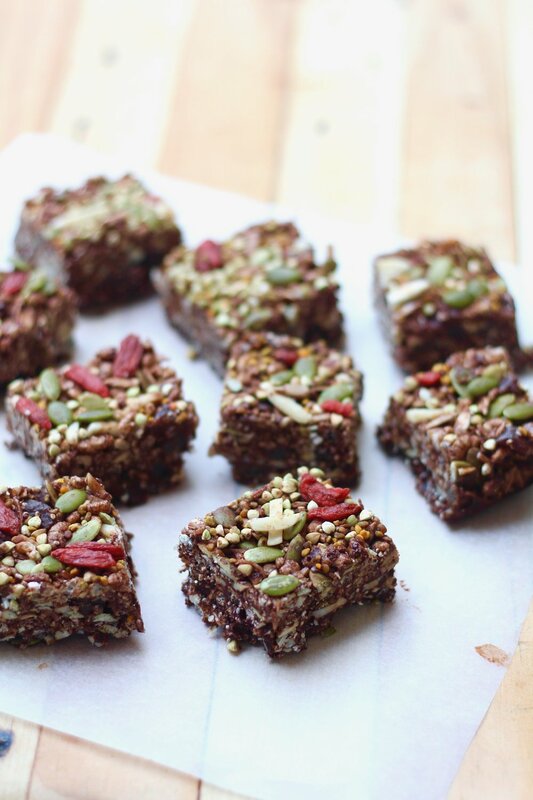 Instead of a base of pure rice crisp cereal, I've also introduced nuts, seeds, coconut and other goodies...these add an incredible texture, and while you still get all of the flavour the bars become much more satisfying and nutrient-dense. To bind the slice I've used honey as it's a sticky sweetener (for a vegan option use rice malt syrup), as well as cocoa butter - when mixed with cacao powder, this is not too far removed from being chocolate, hence they taste amazing! I get a lot of questions from clients as to whether 'natural' sweeteners like honey are healthier for you than regular white sugar - in short, sugar is still sugar no matter the source, and although some sweeteners (like honey) may offer a little more nutrition, we still need to be mindful of minimising our intake - so still treat this slice like the treat it is :). 1. Line a 20.5cm x 20.5cm square cake tin with baking paper. 2. Add to a large bowl the rice crisp cereal, slivered almonds, sunflower seeds, shredded coconut, raisins, chia seeds and pumpkin seeds. Mix together with a spoon until evenly distributed. 3.. Add to a saucepan the melted cocoa butter and honey. Stir over a low heat until combined. Add cocoa powder and cinnamon, and mix well. 4.. Pour melted cocoa mixture over the dry mixture. Using a spatula gently toss until the dry mix is coated evenly. 5.. Add mix into the lined square cake tin, and using the spatula gently press mixture into the tin until compacted tightly. 6.. Wash and dry spatula. Sprinkle over top the optional toppings if using, and using the spatula press down the toppings. 7. Place in the fridge for an hour to harden. Remove and cut into bars or 8 bars or 16 squares. Store in freezer. These will soften at room temperature if left out for long. Cut the slice into 8 bars or 16 squares.